On the night Jesus was betrayed and arrested, Peter struck the servant of the high priest and cut off his right ear. Despite knowing the horrific events that awaited Him that night, Jesus FIRST took the time to reach out to heal and restore the servant’s ear and reprimanded Peter for his action (Luke 22:50-51). Truth be told, Jesus had bigger fish to fry that night. He was just hours away from fulfilling His biggest Commissions – to complete what He was sent to do. The night was just getting started for Him but Jesus always did what He saw His Father do (John 5:19). Even in the midst of conflict and turmoil, God will always restore relationships and heal wounds; that is simply the kind of Father He is. That is how important restoration is to God. It is never God’s will to bring His plans and purposes to pass by creating discord because He believes in unity and love. We cannot effectively accomplish God’s work with fractured relationships all around us or when our soul is bruised. That is why God spends time working in us, as much as around us, before He sends us out to accomplish His work. But, in Joel 2:25, God promises: “I will restore the years that the locust has eaten.” It’s a powerful promise made to His people, who suffered a complete destruction of their harvest to swarming locusts, and I believe that our lost years are not unlike those “locust years” in the Old Testament. God did indeed restore their loss – over and in abundance. He reminded his people He was in their midst and said, “I am the Lord your God” – Joel 2:27. It is God who finds us the green pastures to lie on and it is He who gives us the peace of the Holy Spirit. 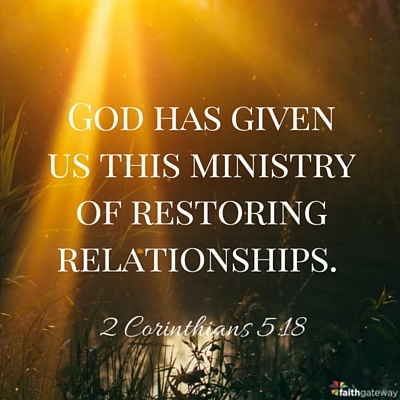 When God begins to restore our soul, He does not want to merely put us back together again. God wants us restored and transformed inside out so we begin to live a life that mirrors Jesus Christ. It is for this reason that God never gives up on any of His children. 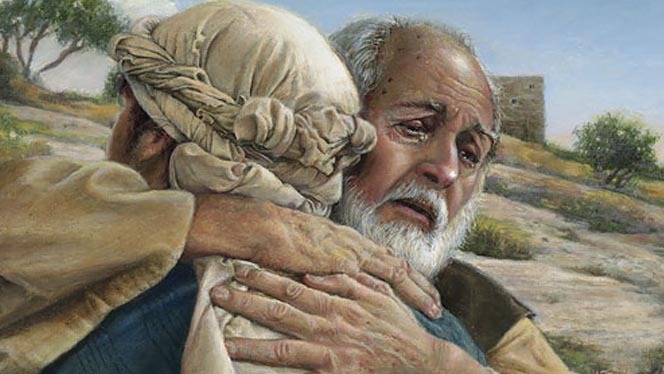 He will lead each of us away from our prodigal paths and back to Him – restored to be holy and righteous as He made us. Jesus said, “Come to me, all you who are weary and burdened, and I will give you rest” (Matthew 11:28). His invitation is for ALL of us to come to Him. That invitation is found repeatedly throughout scripture. Why is God always coaxing His children to come closer? Because above all, He wants to first restore the intimacy that was lost in the garden. God wants to walk shoulder to shoulder with all His children again, just as Adam once did. The key to this restoration happens in the quiet; simply “draw near to God, and He will draw near to you” [James 4:8]. It is only when our intimacy with God is restored can we fully step into what He has called us to do. We cannot fulfill our commission without God leading the way. Jesus died so that we can have intimacy with God again. When He died on the cross, the veil was torn and the intimacy, which was stolen from us because of sin, was restored. Initimacy with God is your portion. You belong to God. You were created to walk closely with Him, as Adam and Eve did in the Garden of Eden. Nothing “can seperate you from the love of God that is in Christ” (Romans 8:38) so it’s time to claim back your inheritance! Restore that Perfect Fellowship; He’s longing for YOU! Suzane Avadiar is a writer, blogger and avid traveller. Over the last 17 years, she has written extensively for various publications in the global marketplace. Writing is not only her passion but also her instrument of worship. She has a deep desire to reveal the Father’s heart through her writings, so that every reader steps into their God-given identity. Suzane also writes daily devotions on social media for her church, Destiny C3 Subang. She recently completed her first book, Sent To Journey – Devotions for the Traveller, and is pursuing publishing opportunities. She can be reached through her blog at www.suzaneavadiar.com or on her Facebook page. SHOULD CHRISTIANS OBSERVE THE ANCIENT RELIGIOUS FESTIVALS? Is Jesus At The Center Of Your All?